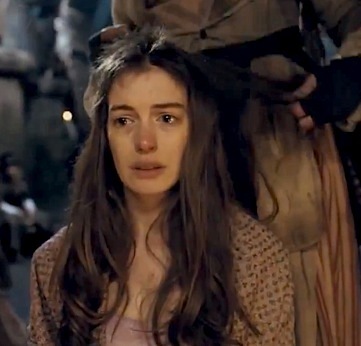 Anne Hathaway tells MTV she cries when she watches herself in Tom Hooper’s Les Miserables because she’s “still connected to the experience of making it.” I, on the other hand, cried because there isn’t a single line of non-singing dialogue. The lack of talking is something you might have missed from reading reviews, which have been mostly positive. Hathaway shines as factory-worker-turned-whore Fantine as does Jackman, Sacha Baron Cohen (for show-stealing comedy relief), Helena Bonham Carter, Isabelle Allen as young Cosette, and Samantha Barks. Just please don’t think I’m exaggerating when I say there’s no talking, because there really isn’t any.